What's Next for Chicago Public Schools? It's been almost four months since Ron Huberman stepped down as CEO of the Chicago Public Schools, and the good news is that the system rolls on without its fearless leader—schools open every day, teachers and other staff report to work, kids attend class, and there was a full basketball season just like always. Brooks high school won the boys city championship, by the way, in a nail-biter against Farragut. Congratulations, coach Bobby Locke. And the bad news? Well, I'm not sure there's really any bad news about Huberman's departure. Pretty much everyone I know—teachers, central office staff, parents—views his tenure as an unmitigated disaster and wants to act like he was never even there. I know there's a tendency in this town to look the other way at the really dumb things Mayor Daley's done, like wasting the better part of two years trying to get us the Olympics, but every now and then it can't hurt to ask ourselves: What the hell was that all about? In this case, Huberman had no educational background—well, OK, he did go to school—when Daley tabbed him to run the school system. He'd been a police officer before he caught Daley's eye in the early 2000s and began working his way up the ranks from executive director of emergency management to mayoral chief of staff to president of the CTA. In 2009 Mayor Daley put him in charge of the schools after Arne Duncan took President Obama's offer and became education secretary. Huberman served less than two years at CPS, so it's hard to say he left a legacy. Well, he did fire a bunch of people—over 500 at the central office—on the grounds that he had to cut the budget. But then he and his top aides got raises, so when all was said and done he didn't really save the system much. I suppose you could call him a pioneer. He was beating up on teachers long before the governors of Wisconsin, Ohio, and New Jersey made it fashionable. Last June the school board adopted a resolution giving Huberman emergency powers to circumvent the union contract and authorize principals to fire virtually any teacher, regardless of seniority or tenure. Over the summer, 1,289 teachers were fired—all in the name of cutting the system's $300 million deficit. I know you hear a lot about the need to rewrite tenure laws so it's easier to fire "bad" teachers—as if good and bad are easy to define. But in this case only 40 of the 1,300 or so teachers fired in the purge had less than a satisfactory rating, according to CPS records. Several of them—like Sunny Neater-DuBow, who I wrote about in September—had received national board certification, one of the most prestigious designations in education, and had been honored by Mayor Daley and the board. In August the Chicago Teachers Union sued, challenging the dismissals as unconstitutional violations of the union contract. The case is still pending in federal court. According to the union, 735 of the fired teachers have since been rehired, which means 554 are still out of the classroom, Neater-DuBow included. In short, here's what Huberman accomplished: He infuriated the union, got rid of some really good teachers, spent money on lawyers fighting the union's lawsuit, wound up hiring back most of the teachers he fired, and left the system still hundreds of millions of dollars in debt. Actually, perhaps I'm being too easy on him. According to the current CEO Terry Mazany, "the system was in free fall," when he took over in November. "There was plunging morale," Mazany told the Tribune on March 7. "Vacancies in key leadership positions. A balkanized organization structure where each unit was doing their own thing. And there was a loss in a unifying vision for education." But in this case, Mazany's a dollar-a-year replacement—he's on leave from his job as president of the Chicago Community Trust—and he's made it clear he's pretty much just holding down the fort until the next mayor figures out who he wants to hire. Which brings us to Rahm Emanuel. It's hard to figure just what he wants to do with the schools. His campaign was short on specifics—other than to sing the praises of charter schools. Charter schools receive public money but are exempt from most of the rules governing ordinary public schools; they can pay their teachers less than the union contract and they don't have to take troublesome students who happen to live in the district. On March 7 Emanuel named an education transition committee that's supposed to—well, it's not really clear what it's supposed to do. The press release announcing the committee members didn't specify that, or why Emanuel had appointed these particular people, or when they were supposed to finish whatever it was that they were supposed to be doing. Not surprisingly, the committee is heavy on charter school boosters—six of its 14 members either run charter schools or work for them, or work for foundations that support them. There are no teacher union officials or past CPS CEOs or school board members. That could be good news—if you favor seizing the moment to break from the past. It reminds me of a time back in 1990 when a group of reformers put together the Sunrise Statement, a ten-point, 12-page manifesto that called for the abolition of the central office. "We're mad as hell and we're not going to take it anymore," the statement began. "After years of working for school reform, we are still standing in the dark, waiting for a new day to dawn for our children. Well, we won't stand in the dark any longer. We are going to make the sun rise over our schools, whatever it takes." Mayor Daley ignored the statement and I'm probably the only person—aside from its framers—who remembers it. I called Ben LaBolt, Emanuel's press secretary, with questions about the education transition team. One of LaBolt's assistants called me back to say she'd send me the relevant press release that would explain everything I wanted to know. Alas, I got a press release that merely listed the members of all of Emanuel's transition committees. So I e-mailed back some specific questions: What was Emanuel's criteria for selecting the members? What's the committee's purpose? Will it be writing a report? If so, when? This is the response I got: "The role of the committee will be to set both short and long term goals for CPS through consultations with every CPS stakeholder." Sigh. I can see Emanuel's press folks are going to be a joy to work with. In other school news, legislators are on the move in Springfield. In late January state senator Heather Steans, who represents a north-side district (the Seventh), proposed a bill that would essentially take charter schools out from the control of the school board and put them under the supervision of a state charter school commission appointed by the governor. CPS presently has the authority to authorize and decertify charters. Meanwhile, state senator James Meeks, who represents a south-side district (the 15th), is pushing a voucher program in which the state would direct money that would otherwise go to CPS to low-income parents, so they could spend it on tuition at private schools. On March 8 the voucher bill passed the senate education committee, seven to three. But it still has an uphill climb to passage, as teacher unions and local school district administrators oppose it. "We've got quite a few new members on both sides of the aisle," says Steve Brown, house speaker Michael Madigan's spokesman. "I'm not sure they've been fully tested on vouchers." In some ways, it seems like 1990 and the Sunrise Statement all over again—with a crucial difference. The Sunrise framers wanted to dismantle the central office and redistribute its budget to the classroom. Steans, Meeks, et al are basically advocating secession—they want to take the kids, charters, and public money, and get the hell out. I can't imagine that Mayor Daley—who rarely ceded control of power and money—would allow them to get away with it. Daley's on his way out, though, and there soon will be a new guy in charge. 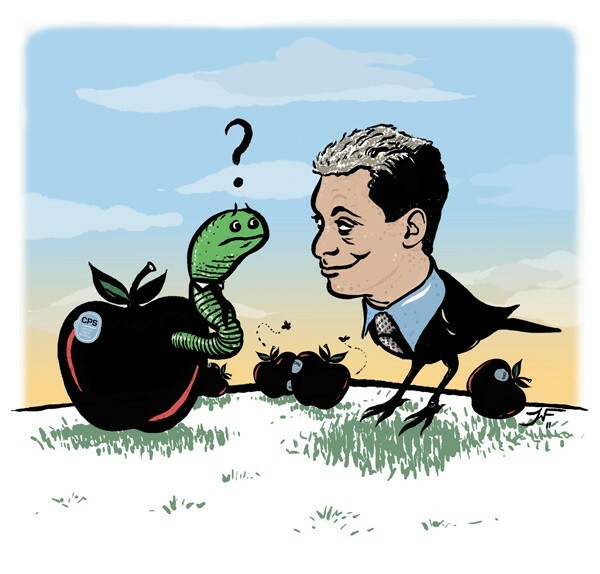 I know Emanuel will be tempted to blame everything on Huberman, but, really, this will be his own headache.